Fact: Nobody stays ahead of the trend curve like NYC girls. Living in Manhattan made that very apparent to me. I was always in awe of how they managed to make commuter outfits look chic, expertly mixed high and low, and mastered the art of layering. 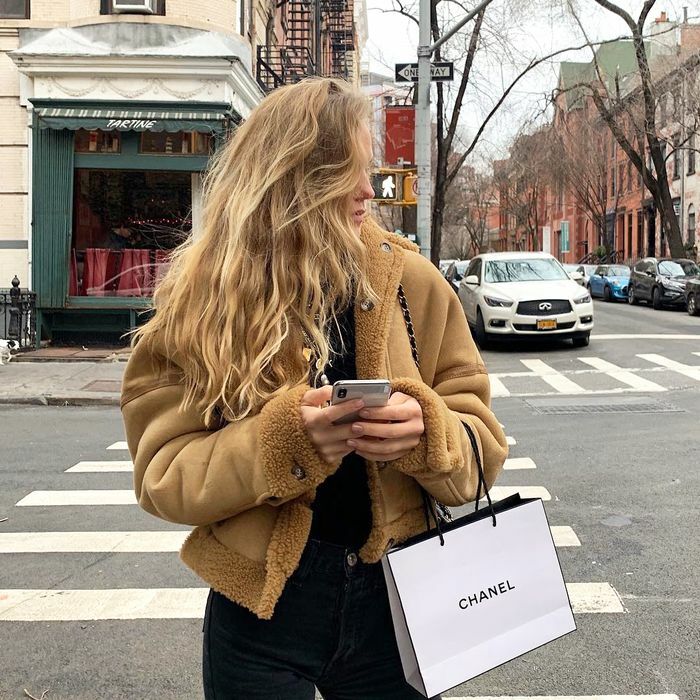 New York also happens to be one of the world's biggest fashion capitals, so who better to turn to for an introduction to brands quickly on the rise? From the most Instagrammable silk tops spotted all over downtown to the whimsical coats taking over the street style scene, below I'm breaking down six popular emerging brands NYC girls are backing. Each brand is worthy of a spot on your radar, and you can bet these are only going to get bigger in 2019. Created with the downtown It girl in mind, Orseund Iris is designed in Brooklyn and adored by celebs like Bella Hadid, Emily Ratajkowski, and Kylie Jenner (just to name a few). The brand can add NYC fashion girls to their rapidly growing list of fans, with styles like corset crop tops and ruched silk slip dresses being crowned city-girl favorites. Oh, and of course that Instagram-famous top you keep seeing everywhere. Here's the Insta-famous blouse in all its glory. Wear it by itself or over a tee. The chicest boilersuit I ever did see. Contrary to what the name suggests, this rising shoe brand is actually made in Italy. Founded in 2005, Paris Texas aims to prove that you don't need a ton of shoes—just the right ones. The label has gained a major cult following in the last six months, counting Emily Ratajkowski, Eva Chen, Aimee Song, and Candice Swanepoel as fans. NYC girls have been particularly fond of the knee-high snakeskin styles this season, and who could blame them? NYC girls can't get enough of this style, in particular. How chic is this shorter style for spring? Launched in 2009 from founder Alyssa Wasko's college dorm room, Donni is a collection of everyday essentials intended to be worn in multiple ways. She named the line after her late father, Donald, and it's now made in Los Angeles and has been spotted on celebrities like Gigi Hadid, Kendall Jenner, Emma Roberts, Emily Ratajkowski, and Lily Collins. Last spring, fashion girls couldn't get enough of Donni's scrunchies, and this winter, the brand's tri-fleece pullover has taken over Manhattan. now fully aware that this was not the week for bare ankles. Or if color is more your thing. In 2016, two former creative heads of a luxury lifestyle brand launched Arjé, combining their well-traveled, semi-nomadic lifestyles with New York and European influences. NYC girls have been living in the brand's insanely chic shearling jackets and cashmere sweaters this winter, and I can all but guarantee they'll be all over Arjé's silk dresses come springtime. Fits in perfectly with the 50-shades-of-beige trend. Cheekily coined "the world's happiest outerwear brand," Dauphinette combines vintage and reclaimed materials in each piece. Hand-painted antique chinoiserie prints, fluffy ostrich feathers, and even tiny ammonite fossils have made their way onto Dauphinette coats, and they really are just as fun as they sound. Nobody does outerwear like Manhattanites, so it's no surprise NYC girls have been all over these statement coats. Who needs a face when you have this coat? Seriously, have you ever seen a happier coat? I will only be wearing coats with feather sleeves moving forward. Founded in 2015 by Marin Hopper, daughter of Dennis Hopper and Brooke Hayward, and named after her grandfather Leland Hayward, the luxury American fashion label fuses generations of Old Hollywood glamour into modern pieces. Made in NYC, Hayward's handbags have become a staple for in-the-know fashion girls and editors alike. A print like this makes even the most basic of outfits stand out. You had me at snake print. Leopard print is considered a neutral now, right? Next up: the coolest things I saw on Instagram this month.